The U.S. Securities and Exchange Commission (“SEC”) announced that it reached a settlement agreement in an Administrative Proceeding brought against E.S. Financial Services, Inc. (“ES”), a Miami-based broker-dealer, for willfully ignoring anti-money laundering (“AML”) procedures under the Bank Secrecy Act and the SEC’s rules, such as reporting, recordkeeping and record retention requirements. 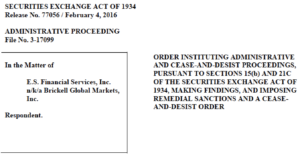 In its Order, the SEC accused ES of knowingly choosing not to comply with anti-money laundering requirements. The broker-dealer was an affiliate of a bank located in Central America (the “Bank”). In January 2003, ES opened a brokerage account for the Bank. That brokerage account was specifically designated for brokerage transactions for the Bank itself. ES did not identify any sub-account holders or other beneficial owners on the account application or in subsequent account ownership documentation. However, the SEC alleged that 13 entities that held accounts at the Bank were sub-account holders of the brokerage account that the Bank maintained at ES. In total, 23 non-U.S. citizens held primary ownership of the 13 entities. Between April 15, 2003 and August 2013, the 23 individuals supposedly obtained securities trading advice, requested account maintenance, and placed securities orders with registered representatives of ES, and received execution through the Bank’s account. The Order states that the 23 individuals executed $23.8 million in securities transactions through the Bank’s account during the 10-year period. At no time did the Bank serve as an intermediary or participate in the advice or execution of any trades on the 23 individuals’ behalf. During the period in question, ES maintained a Customer Identification Program (“CIP”), as required under the Bank Secrecy Act and the SEC’s CIP rules. Those procedures required the collection and verification of specific information pertaining to the account holders of all customer brokerage accounts. Included in these requirements was a Know Your Customer form that was required to contain comprehensive information, including the disclosure of all principals and any beneficial owners associated with the respective brokerage account. According to the SEC, other than tax identification documentation, ES neglected to obtain any customer information on the Bank. ES also allegedly failed to obtain and verify the required information for the 13 entities or the 23 individuals. Furthermore, in response to two different requests by the SEC to provide documents to identify all customers, ES failed to produce account and other associated information to identify the related entities and individuals. While no fraud occurred in this instance, our investigation found there were significant holes in the framework of E.S. Financialʼs CIP that left the firm susceptible to illegal activity by customers who were not fully known … Firms must stick to the CIP rules that require a broker-dealer to establish, document, and maintain procedures for identifying all customers and verifying their identities. The SEC censured ES and ordered it to cease and desist from future anti-money laundering violations. In addition, ES agreed to pay a $1 million penalty, and to retain an independent monitor to directly review its anti-money laundering/CIP policies, procedures, and practices for two years.